Apple pencil gets thumbs up as business aid and drawing tool. My mum bought me an apple pencil for Christmas and I love it! What is an apple pencil? In explanation it is a digital stylus which allows you to handwrite on the IPAD Pro. However it can also be used on my IPAD generation six (2018). This iPad is much cheaper than the IPAD Pro. Mum had bought a new IPAD in July and could not resist buying the stylus.. This was because she heard it was compatible with her new IPAD. She was enthusiastic about it and joked it had given her a new lease on life. Because she was secretary of her Bridge Club she used it for minute taking. It was a smooth writing instrument and she could take notes very quickly. She had always wanted to learn to draw. Fortunately she found that with today’s drawing programs she could more easily reproduce pictures and images. First, Mum found out how to import photographs into these programs, Next she would lower the opacity and trace the shape. Naturally this gave a much better outline of a subject. Shading to get shape was easier. Consequently learning drawing techniques followed. As a result of her purchase her office is now much plainer and less cluttered. Luckily she already had a logitech keyboard for a previous iPad and that had no problem connecting through blue tooth to the new IPAD. For me it is so useful for note taking and consequently note sharing. It does not have to have additional software as the pencil will work on Notes which comes with the IPAD. In Notes you can draw or write. Obviously you can produce your handwritten signature which can be useful for digital documents. There is other software which is useful and is free to download. This allows you write with the stylus. You can choose the sort of paper you want. You can choose the nib of the pencil and the colour. In addition you can erase if you make a mistake. Penultimate synchronises with Evernote a file organisation program so your handwritten notes on the IPAD can be copied to Evernote on your IPAD or PC or Mac. All similar topics can be kept together. For more information on these programs click here. The pencil will work on any of the Microsoft Apps for the IPAD – Word, Excel, Powerpoint etc. 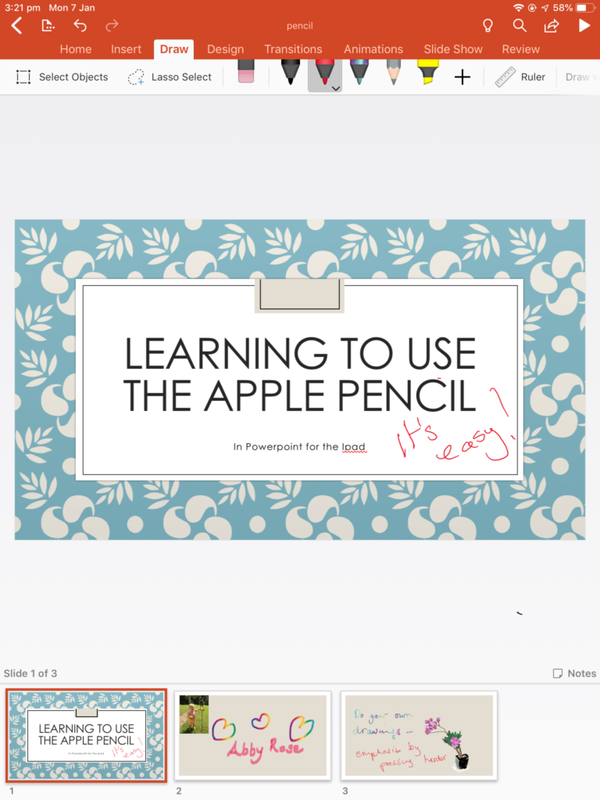 You can use the pencil directly on slides or draw in your own illustrations or mark up slides. The pencil really comes in to its own when used with drawing applications. It is a really good aid for learning how to draw and use shading effectively. Seven year old Abby drew this in Notes after studying NAIDOC week at school. (celebrates aboriginal and islander culture). Luckily Adobe Draw is free to download and use on your IPAD. This has more drawing aids. You can import a photo, reduce the opacity and trace to get the correct shape. You can see the shading from the photo and try to reproduce it. This sketch from a photograph of Kerstin Almström and the photo is from the 1930’s. Abby made this Christmas card in Adobe Illustrator Draw. Admittedly there are probably lots more things to be done with the Apple pencil but I am already busy using it and learning to use it in the applications I already have! Most interesting. I think I shall have to get one! Fun to use I should think but needs a lot of prectise to draw well!